Welcome to the world of OLED TV. More manufacturers than ever are betting on OLED panels for today's high-end television sets, and the premium panel technology is seeing wider implementation and improvement all the time, even becoming the display of choice for the iPhone XS and iPhone XS Max. But what is OLED, and why should you care? Standing for 'Organic Light Emitting Diode', the OLED acronym describes a type of panel that TVs use – like LED-LCD, plasma or CRT. It's different from the other types of panels that have come before it, but the overarching idea is exactly the same: OLED panels help bring images and video to life in front of your eyes. In short: OLED TV truly is the next big thing in home entertainment. It offers better image quality (think blacker blacks and brighter whites), reduced power consumption, and faster response times over traditional LED TVs. So why doesn't everyone own one? Right now, they're still prohibitively expensive and for years only a handful of companies used the technology in their TVs. But that's changing. Sony, one of the initial developers of the technology, got back in the game with last year's Bravia A1E OLED and Sony A8F OLED TV. 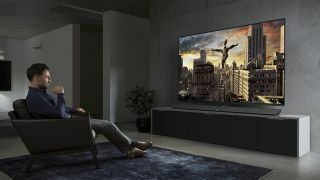 Philips has thrown its hat into the ring with the recent Philips OLED 803 and OLED+ 903; Panasonic has doubled its OLED range for 2019 – led by the GZ2000 OLED – while LG has carried the torch for the last five years with its B-, C-, G-, E- and W-Series OLED TVs. So is OLED worth the hype? We've run you through everything you need to know about latest big screen buzzword in the article below. What's the difference between OLED TV and LCD/LED? Everything. They might sound alike, but the processes are completely different. OLED stands for Organic Light-Emitting Diode, with "organic" referring to the carbon film that sits inside the panel before the glass screen. OLED panels emit their own light when an electric current is passed through, whereas cells in a LCD display require an external light source, like a giant backlight, for brightness. This backlight is what separated LCD screens from their LED variants. A traditional LCD screen has a backlight (called a cold-cathode fluorescent light, or CCFL) which is uniform across the entire back of the screen. This means that whether the image is black or white, it is being lit by exactly the same brightness across the panel. This reduces what we call "hotspots," or areas of super bright light, because the actual light source illuminating them is uniform. This all started a few years back when engineers at companies like Samsung and Sony introduced an array of LEDs as a backlight, which meant that if a certain part of the screen was black then those LEDs behind that portion could be turned off to make it appear blacker. This is a better solution than a CCFL backlight, but it still has its problems. Since it's a light behind the LCD producing the illumination rather than the LCD layer itself, the illumination is not entirely in-sync with the pixel in front of it. The result is an effect called 'blooming', whereby LED light from bright portions of the image bleeds over into areas of blackness. This is what separates OLEDs from LCD/LED displays. In an OLED TV display, the pixels themselves are the things producing the light, and so when they need to be black they are able to turn off completely, rather than relying on a backlight to turn off on their behalf. What are the advantages of OLED TV? The result is remarkably dark blacks in an image, and when you combine this with the brightness of the whites an OLED panel is able to produce you're left with a fantastically vibrant image. LG and Panasonic, pretty much the most consistent producers of OLED televisions on the planet, like to use the term "infinite contrast" to describe how the self-lighting pixels switch off completely when reproducing black giving it an "absolute" black color instead of a "relative" black that only describes how dark one pixel can get compared to the brightest pixel on the screen. For years there was a question mark about longevity of OLED panels, while production lines have been impossible to make profitable due to high failure rates. But as companies like LG invest billions in development of OLED – with the likes of Philips and Sony joining the fray – its affordability is improving, although it's still much more expensive than competing technologies. The advantages of OLED go beyond simple static image quality to the responsiveness and smoothness of the display itself, meaning gamers and home cinema aficionados are going to absolutely love OLED TV. It's capable of a refresh rate of as low as 0.001ms, which for reference, is around 1,000 times faster than a standard LED-backlit LCD panel, while also being superior to the now-discontinued plasma tech, too. And, because the lighting source they use is so tiny, the depth of screen sizes has shrunk at the same rate. That means OLED TVs have awesomely deep blacks and bright, peak whites, improved color accuracy as well as smooth responsive motion - and all from a form factor that's just a few millimetres in depth and much lighter than standard TVs. Which OLED TVs are out now? OLED TVs have been on the market since 2012, and a variety of manufacturers have tackled the technology over the years. It used to be the case that OLED's were produced by just Samsung and LG, but Samsung dropped the technology over its cost and how difficult it was to produce, and has no intention of restarting production any time soon. LG, on the other hand, has been releasing OLED sets consistently over the last few years, and in 2016 introduced four easy-to-understand product lines – the G6, E6, C6 and B6 – featuring OLED panels. LG continued with the 7-Series and 8-Series TVs, while the LG 2019 TV range will include the 9-Series: the budget OLED B9, mid-range OLED C9, high-end OLED E9, and ultra-thin OLED W9. If you're not big into LG TVs, you might like 2018's Sony Bravia A8F and A9F OLED, or Philips' impressive OLED 803 and OLED+ 903 televisions. Meanwhile, Panasonic is releasing four new OLED models this year – the GZ2000, GZ1500, and GZ950 / GZ1000. You can also head to our best OLED TVs guide to see the top five OLEDs we've had the pleasure of reviewing on the site. How much do OLED TVs cost? OLED TVs are definitely getting cheaper, but they're still a long way from what we'd call affordable. The prices of LGs sets start at $1,600 in the US and £1,200 in the UK, and Panasonic's are more expensive still. The scarcity of OLED TVs on the market means that those small number of players in the market are more or less free to charge exactly what they want. We're not going to see prices drop until we get more competition. That said, usually when one company starts to pull ahead, the others quickly catch up. Prices should come down when manufacturers can work out the kinks on the production line and demand increases for these phenomenal pieces of tech. What's the future for OLED TV? OLED is an expensive panel technology that has finally managed to gain traction – after spending so long as an outlier than we wrote an opinion piece in 2014 about how the technology might be dead. Obviously that didn't turn out to be the case, and we're seeing plenty of stunning OLED models hitting the market, even if price points are still taking an age to drop within reach of regular consumers. But just because OLED isn't affordable yet doesn't mean it's not getting better. An $1,600 / £1,200 price tag isn't what we'd consider budget, but it's a great deal cheaper than what OLED was retailing for even just a year ago. If this trend continues, OLED could well become the go-to TV technology for mid-range wallets as well as high-end enthusiasts. Original reporting in this article was by Jamie Carter.